Through original photographs, the Montreal-based photographer and musician shares her reflections on the quiet beauty of windows. Something about a window — its ability to carefully shed light on a subject, or frame the world outside in a certain way. I always choose the window seat when I travel, and despise the people who close the blinds on flights. 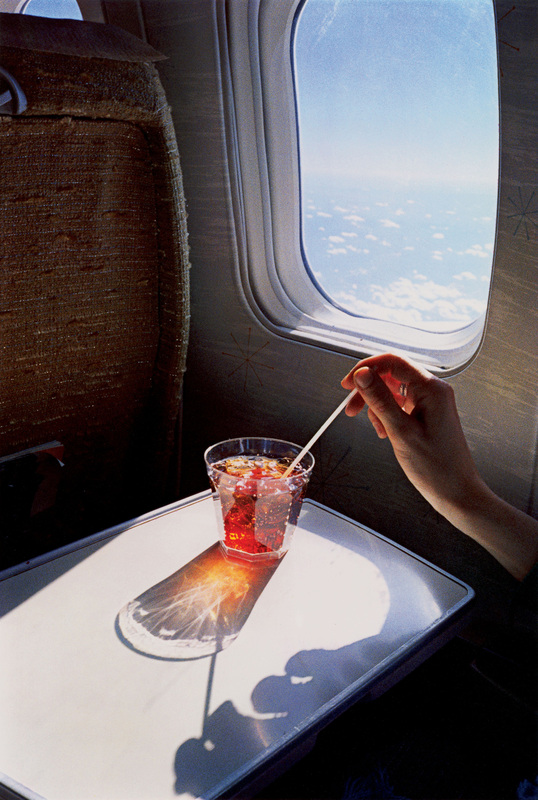 The iconic William Eggleston photograph where sunlight glistens through a drink on an airplane tray table could be my favourite. A postcard of this photo has been taped to the wall of every apartment I’ve lived in in Montreal, and is now tearing at the edges. I’ve attempted to recreate this photo whenever I get the opportunity; a kind of personal homage that will never see the light of day. Windows are not merely physical objects which people observe from; they can appear anywhere, openings in space which allow you to look closer. I often find water to act as a window, abstracting reality on the surface or framing the koi fish swimming beneath. Fences can also act as windows, creating ambiguous foregrounds to shape what’s behind them. Somehow I am so drawn to views like these, and am often amazed when I come across these images in front of me. Last week in Los Angeles I sat next to a Koi Pond for what felt like hours, mesmerized by the fish and their colours and how they skimmed the surface of the water for air. Reflections of the palm trees above rippled and reflected as the koi danced below. For a moment I almost forgot to photograph it. Tess Roby’s solo exhibition LIKE WATER A WINDOW runs April 28 – June 17 as part of Contact Photography Festival in Toronto. More details here. You can find out more about Tess Roby here. Tess Roby is an artist with a vision. The Montreal-based photographer and musician, an eight-year veteran of the Canadian Children's Opera Company, seems utterly original, moving with a restless energy toward the sublime. Her sound betrays an intrepid longing to discover and explore, to reject convention and transcend cliché: Roby is a born traveler, absorbing everything she hears and making it new. Ethereal and crystalline, bathed sumptuously in synths, her music is heady, dreamy, singular -- a transmission from parts unknown. The classical training and aesthetic omnivorousness combine like worlds colliding. The Beacon crowns Ashurst Hill in Dalton, Lancashire, looming over the verdant English countryside nearly six hundred feet above sea level. This spartan brick monolith was erected in 1798 as a watch tower to warn of French invasion during the Napoleonic War -- and there it silently remains, keeping infinite vigil. It stands in Tess Roby's mind. The Beacon calls to her. "Throughout my life I have felt the pull to return to it," she says. "I'm beckoned by father's roots and by the sullen landscape of fields leading to the coast."